As you can see, the market for interactive track notes is starting to look quite busy, with a wide variety of content styles and business models supporting them. However, that isn’t stopping newcomers from trying their hand at the game. Like Matt McClelland, Darren Edwards is a regular bushwalker (he prefers the term hiker) who was frustrated at the limited amount of information provided by the majority of websites. Specifically, Edwards was concerned that much of the track information (he uses the term trails) available was crafted for the tourism industry. Edwards and his partner Julie, who had been recording the details of their walks for some time, decided to launch the website Trail Hiking. “With our website, hikers can search for trails based on location, hiking grading, distance, or they can simply view an alphabetical listing and map views. Trail Hiking hosts GPX files for all trails so that you can easily navigate the trail and to the trail head itself,” Edwards says. Whether it’s the quality of information provided on more than 170 walks around the country, the’ interesting choice of the keywords ‘trail’ and ‘hike’ or (more likely) a combination of both, Edwards says his audience is growing steadily. “Our audience is growing daily and is currently in excess of 6,000 users and close to 30,000 page views on our website each month.” And this growth has led Edwards to making an interesting change in direction. 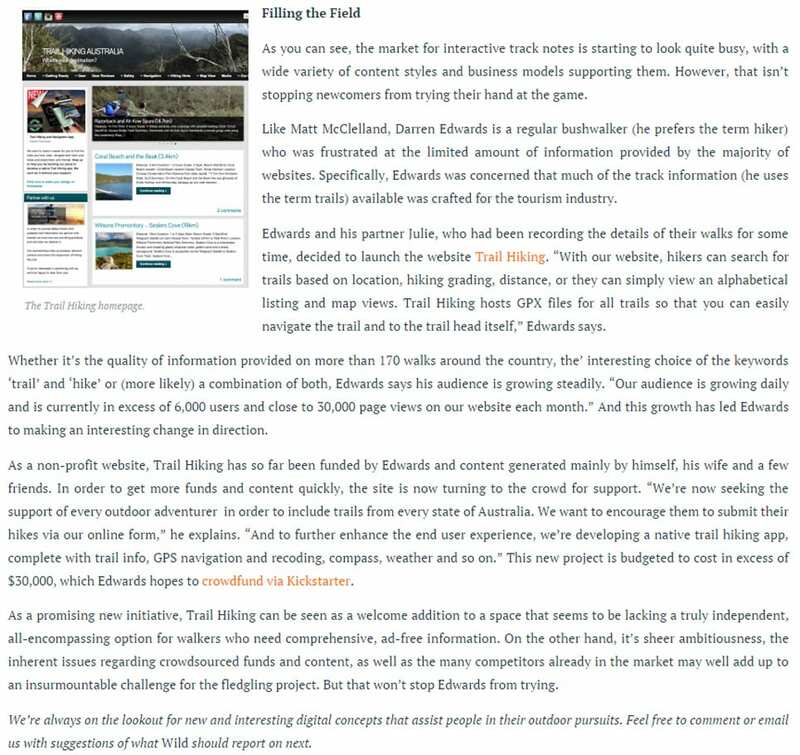 As a non-profit website, Trail Hiking has so far been funded by Edwards and content generated mainly by himself, his wife and a few friends. In order to get more funds and content quickly, the site is now turning to the crowd for support. “We’re now seeking the support of every outdoor adventurer in order to include trails from every state of Australia. We want to encourage them to submit their hikes via our online form,” he explains. “And to further enhance the end user experience, we’re developing a native trail hiking app, complete with trail info, GPS navigation and recoding, compass, weather and so on.” This new project is budgeted to cost in excess of $30,000, which Edwards hopes to crowdfund via Kickstarter. As a promising new initiative, Trail Hiking can be seen as a welcome addition to a space that seems to be lacking a truly independent, all-encompassing option for walkers who need comprehensive, ad-free information. On the other hand, it’s sheer ambitiousness, the inherent issues regarding crowdsourced funds and content, as well as the many competitors already in the market may well add up to an insurmountable challenge for the fledgling project. But that won’t stop Edwards from trying. Great work Darren. Would love to see the south coast WA get in to this.must talk to tourism people here re this.